PT Kereta Api Indonesia (Persero) - KAI or referred to as "PT KAI (Persero)" is the national railways company of Indonesia. Based in Bandung West Java, KAI operates primarily as the operator of public railways in Indonesia. PT Kereta Api Indonesia (Persero) is a non listed state-owned company and is completely owned by the government of Indonesia. At present, KAI has 9 Operation Area Offices (DAOP), 3 Regional Division Offices (DIVRE), 3 Sub Regional Division Offices (SUB-DIVRE), 5 Balai Yasa spread across Indonesia. Its head office is registered at Jl Perintis Kemerdekaan No 1 Bandung. KAI also supported by a total of more than 25,361 staff. As of December 2015, KAI supported by 6 strategic subsidiary companies; PT Kereta Api Logistik, PT Kereta Api Properti Manajemen, PT Kereta Api Pariwisata, PT KAI Commuter Jabodetabek, PT Reska Multi Usaha, and PT Railink. 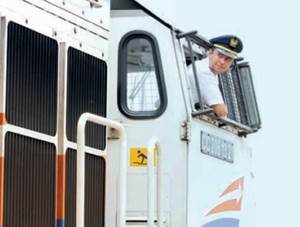 PT Kereta Api Indonesia (Persero) managed to recorded good performance in the business year of 2015. According to PT Kereta Api Indonesia (Persero) Annual Report 2015 as quoted by JobsCDC.com, KAI recorded total revenue of Rp13,938.90 billion in 2015 or an 33.02% increase from the same period last year (2014). KAI's total revenue in 2014 amounted to Rp10,478.07 billion. Referring to its annual report, KAI registered total net profit of Rp 1,398.24 billion in 2015 or 62.27% increase as compared with Rp 860.87 billion in 2014. Calon Masinis : SMA IPA / SMK (Electricity, Mechanical, Automotive). Pengatur Perjalanan Kereta Api (PPKA) : SMA IPA / IPS / SMK Automotive Engineering / Electronics Engineering / Mechanical Engineering / Electricity Engineering. Petugas Rumah Sinyal (PRS) : SMA IPA / IPS / SMK Automotive Engineering / Electronics Engineering / Mechanical Engineering / Electricity Engineering. Petugas Langsir (PLR) : SMA IPA / IPS / SMK Automotive Engineering / Electronics Engineering / Mechanical Engineering / Electricity Engineering. Petugas Wesel (PJW) : SMA IPA / IPS / SMK Automotive Engineering / Electronics Engineering / Mechanical Engineering / Electricity Engineering. Pengawas Peron (PAP) : SMA IPA / IPS / SMK Automotive Engineering / Electronics Engineering / Mechanical Engineering / Electricity Engineering. Pemeliharaan Sarana : SMK (Electricity, Electrical, Mechanical, Automotive). Pemeliharaan Jalan Rel dan Jembatan : SMA IPA / SMK Building. Pemeliharaan Sintelis : SMA IPA / SMK (Electricity, Electrical, Electronics, Mechantronics, Telecommunication, Electricity Power). Minimum average national exam score (NEM / UAN) of 6.0 (six point zero). Age as of 1 August 2017 : Minimum 18 years old and maximum 25 years old. Minimum height of 165 cm with an ideal weight for Calon Masinis, PPKA PRS, PJW, PLR, and PAP. Minimum height of 160 cm with an ideal weight for Tenaga Pemeliharaan Sarana, Sintelis, dan Prasarana. Willing to be placed in all working areas PT Kereta Api Indonesia (Persero). Not involved in drugs or psychotropic, not tattooed, and not pierced. Never been sentenced to imprisonment based on court decisions that have permanent legal force. Have no marital relationship with the employee of PT Kereta Api Indonesia (Persero). Never be dismissed in subsidiaries or other institutions due to disciplinary action and is willing to resign from the working relationship with other institutions if passed the selection. Passed in all selection process organized by the recruitment committee of PT Kereta Api Indonesia (Persero) 2017. JobsCDC.com now available on android device. Download now on Google Play here. Please be aware of recruitment fraud. The entire stage of this selection process is free of charge. PT Kereta Api Indonesia (Persero) - SMA, SMK Fresh Graduate External Program KAI July 2017 will never ask for fees or upfront payments for any purposes during the recruitment process such as transportation and accommodation.